For attitude work, we would like to use a spectral region for which the Earth has a uniform intensity. The considerable fluctuations in the 11- to 14-jim window can be seen in Fig. 4-7. Similarly, the H20 band intensity near 7jtm depends on the strongly varying H20 density in the atmosphere. 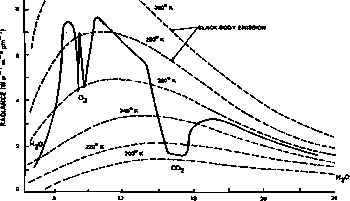 The C02 band provides a more uniform distribution than the HzO bands [Dodgen and Curfman; 1969]. This spectral region has been used for horizon attitude sensors for a variety of missions, such as SMS/GOES, CI S, AE, and SIRIO, and is proposed for missions requiring precise horizon definition, such as HCMM, SEASAT, DE, and MAGSAT. The Appearance of the Earth's Horizon at 14.0 to 16J pm. To effectively use the infrared radiation from the C02 band at 14.0 to 16.3 jxm for attitude determination, we need to model the appearance of the Earth's horizon in this spectral region. Although several analytical models of varying complexity have been developed [Bates, et al., 1967; Thomas, et al., 1967a; Thomas, 1967b; Weiss, 1972; Langmaier, 1972; Howard, et al., 1965], the results of only one extended experiment are available in the open literature. 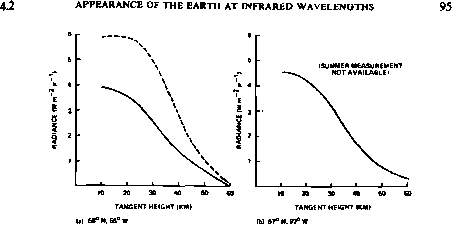 These are from Project Scanner, carried out by NASA's Langley Research Center specifically for the study of infrared horizon profiles [McKee, et al., 1968; Whitman, et (&., 1968]. Project Scanner consisted of two suborbital rocket flights on August 16 and December 10, 1966, and associated meteorological measurements. Both rockets were launched frfem Wallops Island, Va., to peak altitudes of 620 and 709 km, respectively. 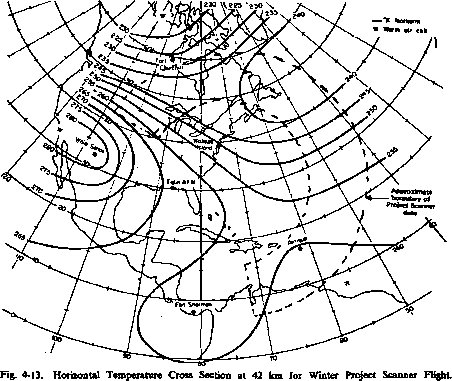 Horizon measurements for both flights covered a latitude range of 10° to 60° North from approximately the northern coast of South America to central Hudson Bay. were particularly large in the winter flight. 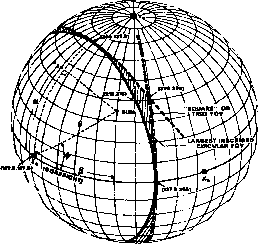 The horizontal coordinate is the tangent height or the minimum altitude above the surface of the Earth for an unrefracted light ray coming from behind the Earth through the COz layer to the spacecraft, as shown in Fig. 4-10. Thus, the tangent height is the apparent height (at the horizon) from which the radiation is coming. From Fig. 4-9 it is clear that horizon scanners sensitive to the COz band radiation should indicate the presence of the Earth or trigger in the general range of 30 to 50 km above the surface. Fig. 4-10. 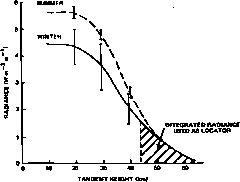 Definition of Tangent Height, A. A' is an example of negative tangent height. 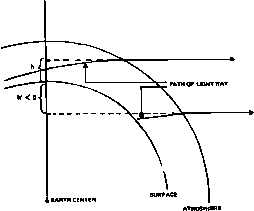 The radiance profile for the Earth's horizon depends primarily on the effective temperature, the effective pressure, and the optical depth, with temperature fluctuations being the most important factor [Whitman, et al., 1968]. Temperatures at the altitude of the top of the COz layer are governed primarily by latitude, season, and local upper-atmosphere weather conditions. Because of the very limited amount of data, accurate statistics do not exist on the variability of the height of the COz layer or the temperature in the 30- to 50-km altitude range. Figure 4-11 shows the effect of seasonal and latitudinal variations in the Project Scanner data and one example (subfigures (a) and (b)) of longitudinal variations. Note that temperature changes affect the radiance profile most strongly at the peak radiance levels below about 30 km. Thus, in Fig. 4-11, there is greater uniformity in the lower tail than in the peak level. Because temperature variations appear to be the prime determinant of changes in the radiation intensity in the COz band, it is of interest to examine the degree of nonuniformity in upper atmosphere temperature profiles. 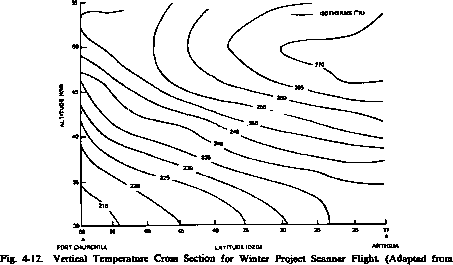 Derived temperature profiles for the Project Scanner winter flight are shown in Fig. 4-12 for a vertical cross section covering the latitude range of the horizon scanner data and in Fig. 4-13 for a horizontal cross section at an altitude of 42 km. The approximate boundary of the measured data profiles is also shown in Fig. 4-13. Tlie 42-km profile of Fig. 4-13 goes through the center of a warm pocket over White Sands, New Mexico, and has more horizontal variability than the other altitude profiles which were plotted over the range of 30 to 54 km in 4-km intervals. The temperature profiles for the summer flight were generally more uniform, with less than 5°K variation over the range of the horizon scanner data at an altitude of 40 km. gradients are large, the analytic techniques used to predict radiance profiles for attitude sensing are inadequate [Whitman, el a!., 1968]. The analytic techniques used to date employ a shell model for the atmosphere in which the temperature is a function only of the altitude. Because any one scan line from a spacecraft to the horizon covers a wide geographic area, a strong horizontal temperature variation violates a basic assumption of the model. Note that although the temperature strongly affects the height of the C02 layer, the top of the COz layer does not fall at any specific temperature level. procedure does not work well for real conditions with horizontal temperature gradients; these might be expected to have an effect on the peak radiance and, therefore, on the normalization process. the l-o random fluctuations were only reduced to about 3 km. * These results do not take into account variations due to horizontal temperature gradients. The C02 band has been found to be more stable than the HzO band, but variations at the level of several kilometres are a function of the local meteorology. The need for additional analysis of real data is clearly indicated.